Former professional football player who is known for his work as a forward on several different clubs including Vasco da Gama, Plameiras, Fiorentina, and Brazil's national team as well. He is also known for his sportscasting career as a correspondent for Rede TV. He started his youth career in 1982 when he joined the Vasco da Gama academy. 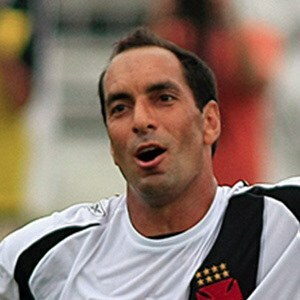 He then started his senior career with the club in 1991. The following year, he made his debut with the Brazil national team. Upon retiring in 2008, he joined the Rede Bandeirantes network where he covered the 2010 FIFA World Cup as well as the UEFA Euro 2012 Championships. He has won several awards for his playing including the Brazilian Serie A Top Scorer in 1997, South American Player of the Year in 1995, and the FIFA Club World Cup Silver Ball in 2000. He was born and raised in Niteroi, Brazil and shared a photo with his two daughters through Instagram in August of 2018. He played alongside Jorge Valdivia and Marcos Roberto Reis as part of the Palmeiras club during the 2007 season.